Why haven't I received the “Curious” badge? As you can see in the picture, I have 13 out of 5. But it's been like this for about two months! What's the reason for that? This other answer by Robert covers the whole aspect of why you failed that second criteria and how to fix it. You have some negatively scored deleted questions. This one for instance and probably others. You've also one that you haven't deleted. You could try improving them and then undeleting them to see whether you can rescue them. Alternatively you're just going to have to ask more good questions to balance out the deleted bad ones. See this answer for more details on the calculation. Not the answer you're looking for? Browse other questions tagged support badges profile-page badge-progress asking-days-badges . Why I didn't received a Bronze Medal after reaching the goal “Curious”? How can one find out your progress towards the Curious, Inquisitive & Socratic badges? 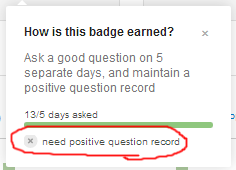 Why didn't my latest (well-received) question go towards my “Curious” badge? Why is the 'question record' not shown in the profile?